Is it time for Christmas crafts yet?! Christmas is getting closer and we LOVE easy Christmas crafts for kids, so today we have put together a selection of our favouite Christmas crafts for kids to make over the festive season. There will be some toddler Christmas crafts, some preschool Christmas crafts and of course some Christmas crafts for older kids too! Scroll through all the easy Christmas craft ideas below and click on the links to be taken to full instructions. You might also be interested in our salt dough ornaments, (a few of which have been included in this Christmas craft list) and our Christmas colouring pages. When children think of Christmas the first thing they often mention is Santa, so it goes without saying that santa themed Christmas crafts are going to be popular with kids! If you are looking for easy christmas crafts for kids that they can play with you will love our Santa puppet craft made from a wooden spoon! I also must mention our popular Santa salt dough handprint ornament, as it is one of my favourite Christmas crafts. Where would Santa be without rudolf! Rudolf crafts always look cute with his bright red nose. These fingerprint reindeers make a really easy Christmas craft for kids and they make cute gift tags too. If you make a santa spoon puppet you might want to make a rudolf puppet to go with it and these salt dough footprint reindeers are really cute. You could also make a reindeer Christmas card complete with handprint antlers. Don't forget to mix up some magic reindeer food for Christmas eve using our free reindeer food printables. Nativity crafts are an obvious choice when thinking about Christmas crafts for kids as it is important for children to learn about the Christmas story and the true meaning of Christmas as well as about Santa! One of my favourite nativity crafts is this handprint and footprint nativity craft. It would be so cute made from tiny baby footprints! If you are looking for preschool Christmas crafts you are going to love our spin art Christmas trees! They are so much fun to make! These footprint Christmas cards are pretty cute too! Making a fingerprint Christmas tree ornament couldn't be simpler, but these salt dough ornaments look so effective hanging on the Christmas tree. Children just love making handmade ornaments that they can hang on the tree. We have a huge collection that we bring out year after year. A few of our favourite easy Christmas ornament crafts for kids are our salt dough star ornament that doubles up as a picture frame, our woodslice fingerprint snowman ornament (we made a finger penguin ornament too) and our candy cane bead ornaments. 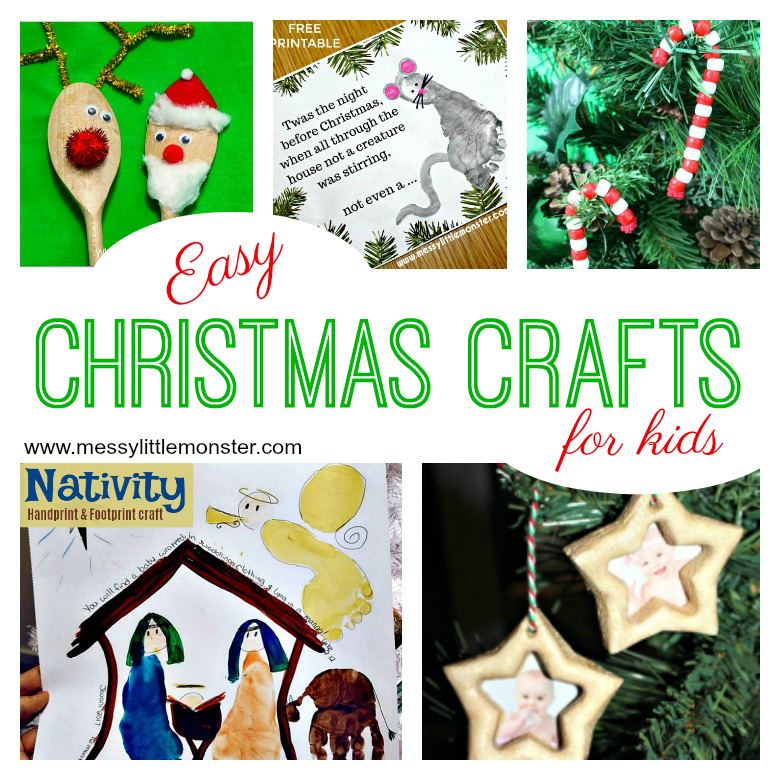 That is just a few of the fun and easy Christmas crafts for kids that we have enjoyed over the years. Christmas really is the most fun time to craft so ENJOY! I can't wait to share this years Christmas crafts with you. 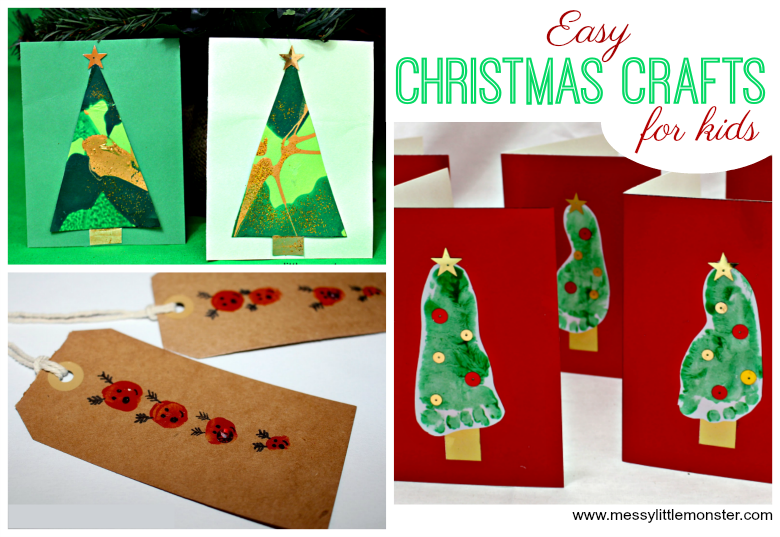 Which of these Christmas crafts for kids do you think you will try first?